Mark Cavendish will play a supporting role to Dimension Data team-mate Edvald Boasson Hagen in Sunday's Paris-Roubaix one-day classic. The Manxman has attempted the 'Queen of the Classics' only once, when he failed to finish in 2011. The sprinter, 30, said: "I hope to get a bit deeper into the race than last time and help Edvald later on." Cavendish has won 26 Tour de France stages and the Milan-San Remo 'monument' in 2009. The 257.5km route across northern France, nicknamed the 'Hell of the North', is famous for its cobbled sections. Switzerland's Fabian Cancellara, who won Paris-Roubaix in 2006, 2010 and 2013, and Slovakian world champion Peter Sagan - winner of the Tour of Flanders last Sunday - are the favourites. Defending champion John Degenkolb, from Germany, is absent as he continues his recovery after being hit by a car while training in Spain in January. Britain's Luke Rowe, who finished fifth in the Tour of Flanders, and Ian Stannard will lead Team Sky's challenge. 2011 world champion Cavendish said: "We've come to Roubaix and we've got no pressure. We're not the big favourites but definitely we can be in the mix at the end." 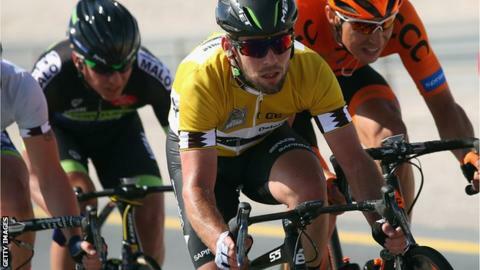 Cavendish, who won the Tour of Qatar for the second time in February, is focusing on this year's Tour de France and the Rio Olympics.